A very significant development in twentieth-century astronomy was the invention, beginning in the 1930s, of radio telescopes, which permitted the detection of low-frequency radiation from celestial sources. Radio astronomy did not originate as a concerted program by astronomers but rather emerged by chance in the course of attempts by electrical engineers to identify sources of noise in radio communication. Karl Jansky (1905-1950) was an engineer at Bell Telephone Laboratories in the 1930s, working at a facility in New Jersey on the problem of interference in trans-Atlantic telephone communication. Using a rotating radio receiver, he detected in 1932 "a very steady hiss type static the origin of which is not yet known" (Sullivan 1984, 12). which he was able to show was astronomical in nature and emanated from the band of the Milky Way. He published his results in a journal for radio engineers, although his findings were also reported in popular astronomical periodicals of the day. During the years 1932-1937 Jansky worked alone on the problem of "star static." If modern science has any heroes, Jansky's efforts at this time cast him among them. His radio astronomical research was sometimes acknowledged by professional astronomers but failed to excite serious interest in the research community. After 1937 he returned to work on problems of terrestrial noise in radio communication. He suffered from a debilitating kidney ailment that led, in 1950, to his death. 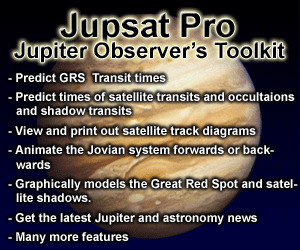 Jansky's pioneering astronomical efforts were continued by Grote Reber (1910-1999), another radio engineer, who, in the 1940s, used a backyard paraboloidal dish in a suburb of Chicago to create the first map of celestial radio sources. It would later be established that the radiation detected by Jansky and Greber emanated from the Milky Way galaxy and was the result of a blending together of a large number of sources into what is known as synchroton radiation. The latter is emitted by particles moving in very strong magnetic fields and is typically associated with the remnants of supernovae. The event that led to radio astronomy on a large, organized scale was the intensive development of radio and electronic technology during World War II. After the war, many of the scientists who had been involved in military projects retooled their radar equipment and receivers and began to carry out research in radio astronomy. Pioneers were Stanley Hey (1909—2000) and his colleagues in Britain's Army Operational Research Group, Bernard Lovell (1913-) at Jodrell Bank, Martin Ryle (1918-1984) and Graham Smith (1923-) at Cambridge's Cavendish Laboratories, John Bolton (1922-1993), Gordon Stanley (1921-2001), and Bernard Mills (1920-) in Sydney, Australia, and Harold Ewen (1922-) at Harvard. Several areas of investigation emerged. One involved the analysis of solar radiation and the investigation of radio waves emitted by the solar corona. Another was initiated by work in 1944 of the Dutch theorist Hendrick van de Hulst (1918-2000), who predicted that neutral hydrogen atoms in space should emit radiation at the 21-centimeter wavelength. In 1951 this radiation was detected by Ewen and the Harvard researchers. Jan Oort in Holland established a program of research in the 1950s that was successful in using the 21-centimeter band to map out the arms of the Milky Way galaxy. A third area of research focused on objects with very small angular diameters that were strong emitters of radio waves. The first of these powerful discrete sources was identified by Hey and his collaborators in 1946 in the constellation Cygnus and designated as Cygnus A. Another such source, Cassiopeia A, was discovered in 1948 by Ryle and Smith. In the early 1950s Baade and Rudolph Minkowski (1895-1976), working with the Palomar telescope, established that Cassiopeia A was a galactic nebula (an object within the Milky Way galaxy) with unusual filamentary structure. It would later be determined that it was the remnant of a supernova some 11,000 light-years from the Sun. Cygnus A was found to be a 17th-magnitude galaxy with a substantial red shift, indicating that it was a very distant and very energetic source of radio waves. It was the first of the "radio galaxies" to be discovered. The collaboration between optical and radio astronomers would prove to be very fruitful—among the immense number of nebular objects, the radio data enabled the observer to identify particular ones for detailed optical investigation. is the 273rd object in the third Cambridge survey. The Cambridge group also pioneered methods of interferometry, in which the same source is observed by two radio telescopes. The two signals are relayed to a receiver, and the interference between the two enables one to determine the position of the source with an accuracy that is proportional to the separation between the telescopes. The examination of the optical counterparts of discrete radio sources had revealed that many of them were distant galaxies. Ryle came to believe that the majority of these sources were extragalactic. He became interested in the cosmological implications of radio astronomy and carried out counts of discrete radio sources with distance. In 1955 he announced that his results indicated a statistically anomalous increase of faint sources with distance and therefore with earlier time, a crucial piece of evidence against the steady state theory, which required uniformity in both space and time. Ryle's claims were controversial and were criticized both by Australian researchers in radio astronomy and by the founders of the steady state theory itself. Nevertheless, as Ryle himself observed, his research seemed to show that it was possible, in principle, to distinguish empirically among the competing predictions of the different world models, an exciting fact in itself. Ryle's contributions to science were recognized in 1974, when he and Anthony (1924— ) became the first astronomers to receive the Nobel Prize. With further advances in interferometry the resolution of radio receivers improved. By the early 1960s, fairly accurate coordinates for a large number of discrete sources were available. Examined in the great California reflectors, some of these objects appeared to be star-like, with extremely unusual spectra. Two examples were the sources 3C 48 and 3C 273. Jesse Greenstein (19092002) and Maarten Schmidt (1929-) were astronomers at Caltech involved in the analysis of their spectra. In 1963 Schmidt realized that the unusual character of 3C 273's spectrum was a result of the fact that its hydrogen emission lines were shifted by an extremely large amount to the red; the red shift was so large that the spectrum had appeared unrecognizable. The huge red shift implied that it must be extremely distant in space, a very compact and incredibly powerful source of energy. A similar conclusion followed for 3C 48. These objects became known as quasars, short for quasi-stellar radio sources. The name proved to be somewhat misleading since it was soon found that many of the star-like sources with large red shifts were radio-silent. 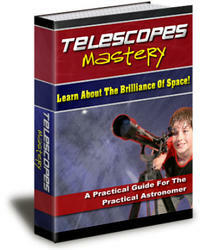 Nevertheless, the name stuck, and quasar astronomy developed into an important field of research. The discovery of quasars seemed to provide evidence for the big bang theory since it apparently showed that the more distant universe was different from the nearer universe, as one would expect in an evolving cosmology. Astronomers hypothesized that quasars were the active centers of galaxies, possibly associated with the collision of two galaxies. Because the earlier universe was denser and more crowded, such collisions would have been more frequent. These speculations did not impress opponents of the big bang theory, who reasoned that as one looked out into the distant universe, it was natural to encounter diversity; the identification of unusual objects was to be expected. Supporters of the steady state theory also questioned the "cosmological" interpretation of the quasar red shifts as arising from the expansion of the universe described by Hubble's law. They suggested that they may result instead from objects thrust out with great velocity from relatively nearby galactic cores. Although the discovery of quasars was an important event, the debate in cosmology continued, and no consensus was forthcoming. Figure 9.1: Wilson and and the Holmden microwave receiver. Bettmann/ CORBIS. is characterized by a graph relating wavelength and intensity. Penzias and Wilson were interested in radiation of very low intensity. They fitted the horn receiver with a liquid helium load that could be used as a comparison to accurately measure a low-noise signal coming into the horn. 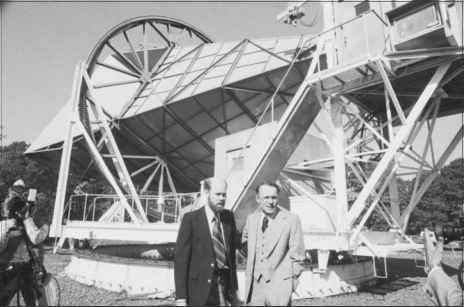 Penzias and Wilson possessed an instrument of unprecedented sensitivity, capable of making accurate measurements of very weak radiation. They picked up a steady three-degree-Kelvin noise in the microwave band that seemed to emanate from all parts of the sky. In order to make refined observations of galactic sources, it was first necessary to identify the source of this radiation. Despite repeated attempts over a one-year period, they were unable to trace it to any of the likely sources—nearby New York City, contamination on the surface of the receiver, or even radiation from within the galaxy. At the same time they were working on this problem a group of astronomers at Princeton University, under the direction of Robert Dicke (1916-1997), was investigating models of the early universe. A former student of Dicke's, James Peebles (1935-), had discussed the "cosmic electromagnetic radiation" associated with the early universe in a paper delivered at The Johns Hopkins University early in 1965. In effect, Dicke and Peebles were duplicating the research of Gamow, Herman, and Alpher from over 15 years earlier, which had been largely forgotten. Through their contacts in the astronomical community Penzias and Wilson became aware of the work of Dicke, and a meeting was arranged between the Bell scientists and the Princeton group. Dicke realized that the three-degree excess noise in the Holmden horn receiver was consistent with the radiation that would have been emitted following the big bang. The radiation appeared to be a fossil relic left over from the initial cataclysm that created the world. The discovery of the microwave background radiation turned out to be a turning point in the history of cosmology, comparable to Hubble's 1929 discovery of the red shift relation. It provided concrete physical evidence for the big bang theory. There was no immediate explanation for its existence in steady state or other alternative cosmologies, and the majority of the scientific community was won over to the big bang idea. Following 1965, cosmology began to be taken much more seriously, both scientifically and institutionally. High-energy physicists became interested in the subject, and graduate courses in it became a regular part of astronomy programs in universities. Financial support for research in extragalactic radio and optical astronomy increased. In 1978 Penzias and Wilson were awarded the Nobel Prize in physics for their discovery. The standard cosmological model accepted today by the astronomical community is the big bang theory. Further evidence for this theory emerged in the 1960s and 1970s from estimates of the frequency of helium in the universe. Surveys of near and distant regions indicate a constant ratio of helium to hydrogen: for every 10 atoms of hydrogen, there is 1 atom of helium. It is believed that this amount of helium could not have been produced in stars and that some of it must have resulted from fusion processes in the primordial conditions of high temperature and density following the initial bang. The frequency of isotopes of such light elements as hydrogen and lithium also appears to point to a prestellar origin in the big bang.